The new version of drivers ISCT intended for Intel ® Core ™ i5 mobile processor, Intel ® Core ™ i7 mobile processor, Intel ® Core ™ i7 mobile processor Extreme Edition. Drivers Smart Connect Technology (ISCT) supporting chipset Intel HM70, B75, HM75, Q75, Z75, HM76, H77, HM77, Q77, QM77, QS77, UM77 or Z77. Drivers are designed for operating systems Windows 7/8 at 32 or 64 bits. 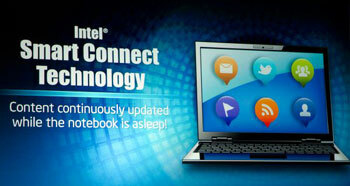 Intel® Smart Connect Technology is designed to update programs by periodically waking your computer from sleep/standby mode for a short time. This function works with applications that automatically get their data from the Internet, such as Microsoft Outlook*, Microsoft Windows* Live Mail and Seesmic*. The amount of time the feature waits to wake your computer can be set using the slider bar under the Basic tab of the user interface. The time can be set from every five minutes to every 60 minutes, the longer time between updates, the less power the feature consumes. Under the Advanced tab in the user interface, you can set a time for Intel Smart Connect Technology to work in Extended Power Savings mode. This night time mode updates your computer every two hours, saving power for the times you are not using your computer. If your computer is equipped with an Intel® WiFi card and Intel® PROSet/Wireless Connection Utility, Intel Smart Connect Technology searches for Wi-Fi networks you have previously accessed. Your computer does not update until it recognizes a known Wi-Fi network.